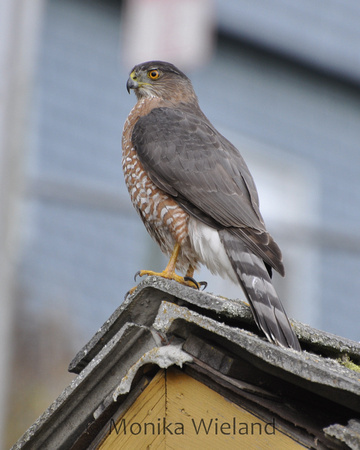 Is he the sneaky chappy or lord of all he surveys? 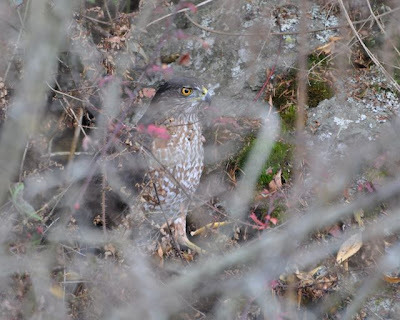 Nice pics, seen our sparrowhawks (almost identical) sneak through bushes to get closer for an ambush but never seen them low down in a thicket lookin for worms/bugs etc. I love birds of prey. They are so fascinating and beautiful. Great pics! Due to the head and lack of squareness it looks to be a Sharp Shinned Hawk. Anonymous - Thanks for your comment. I'm actually pretty convinced it was a Cooper's using many of the features on the link you provided. It was a very large bird. Could very well be a female sharp shinned due to the size. I'm not convinced it's a coopers. Coopers are much more blocky headed. any more photos?